Each year Quilt NSW has a Suitcase Challenge were members create quilts 40cm x 40 cm to a set theme. When I saw the prefix RE of the challenge words I immediately thought of the song Do Re Mi from the musical The Sound Of Music. It's one of those fun songs I remember singing at school and I did love the movie. 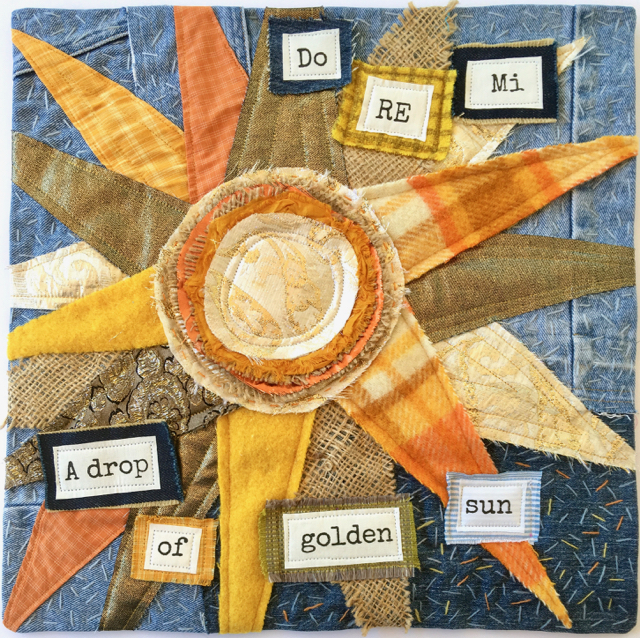 As you can see Re or Ray is described as "a drop of golden sun". So I set about making a golden sun using various materials, an old shirt, hessian coffee bag, woolen blanket, 60's brocade, a bit of silk sari all on a base of old blue denim jeans. 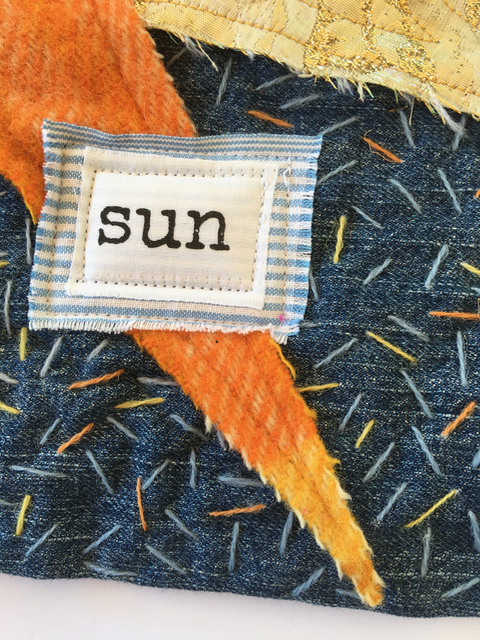 My home is solar powered so as I sewed with these recycled fabrics I thought of how the suns rays are repurposed into the energy that powers my sewing machine, lights and the radio that keeps me company as I sew. 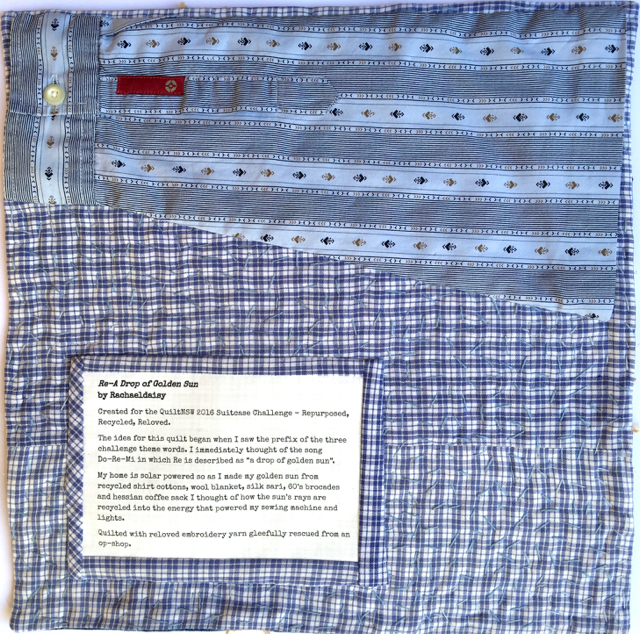 To continue the Repurposed Recycled and Reloved theme I made the backing from an old shirt. The hanging sleeve was inspired by a post LeeAnn of Nifty Quilts posted a few years ago. Simply cut off a sleeve and sew it on, button, label and all. I know raw edges make some people nervous but I love that I can use a collage style with these smaller quilts. I wanted a rugged, worn look with this quilt and the words to look as though they are cut out of paper. If I need to wash this little quilt for any reason it's just a matter of gently hand washing in a sink. Fraying just adds to the effect and texture. I know because I tested it on a quilt I made last year by putting it in the washing machine. It turned out just fine. To see the other entries in this fun challenge visit QuiltNSW's website here. Make sure you click on each thumbnail to see the quilt properly and read the inspiration story that goes with each one. It's wonderful to see the variety and clever interpretations of the theme. 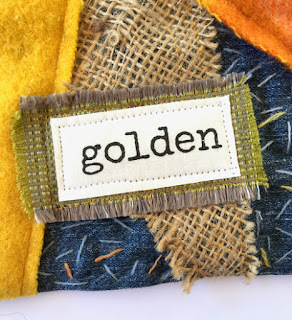 And if you'd like to see some of my challenge quilts from past years hop over to this post to see what I made for "Mini Modern" and "Colour Collision". Next years theme is Remember. Hmmm I wonder what I'll make for that one. This is such an awesome quilt! Love the details so much and the backing is perfection! Always so fun to see the results of your quilting efforts Rachael! What a fun challenge! I love the hanging sleeve idea from an old sleeve of a shirt. I had read LeeAnn's post but forgotten about it. Thanks for the reminder! Your quilt is shining with all the stitches. You are one creative girl. I love your ray of sunshine mini quilt!!! Rachael you are amazing! Your creativity is so special and knows no bounds! Just love this little quilt. What a fabulous sleeve too. I always love to see how your creative mind interprets a theme. 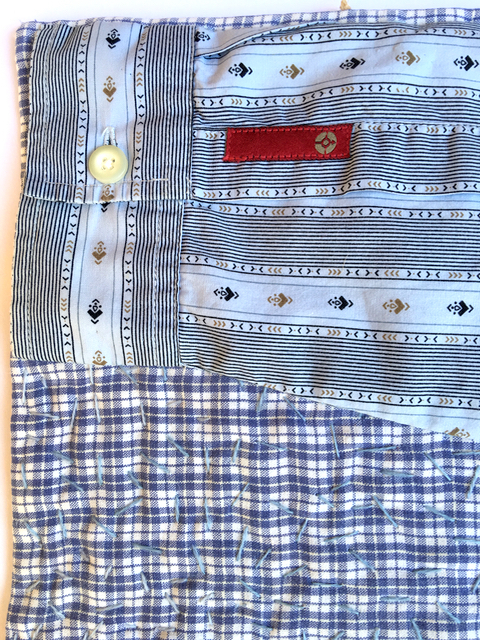 Your quilt is delightful and the hanging sleeve is a perfect piece for recycle and repurpose. That's perfect -- and a challenge right up your alley. So Darn Cute!!! Love it, a great interpretation of the theme and a new style of hanging sleeve to me! Very creative! 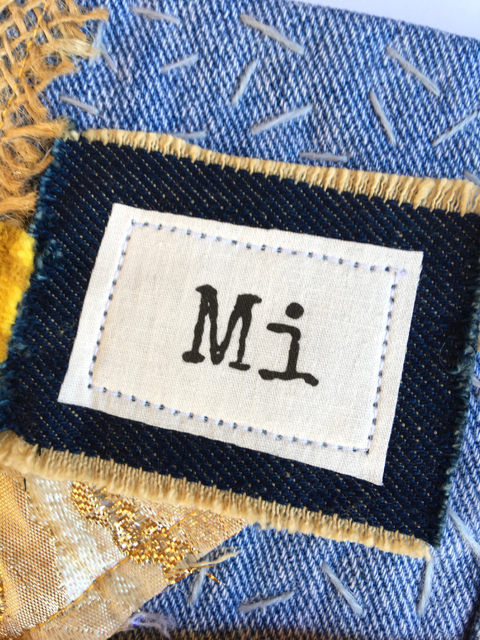 I love your stab-like stitching on the denim, and the recycled hanging sleeve is the perfect extra little surprise! What a happy and clever piece! Whoever gets it will be singing "Do Re Mi" and smiling every day. 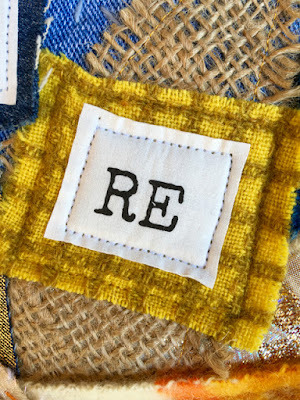 The hanging "sleeve" is perfect on this repurposed quilt! Great interpretation of the theme and in your style. I've loved reading the story behind this quilt. The hanging sleeve is the perfect touch for your project. 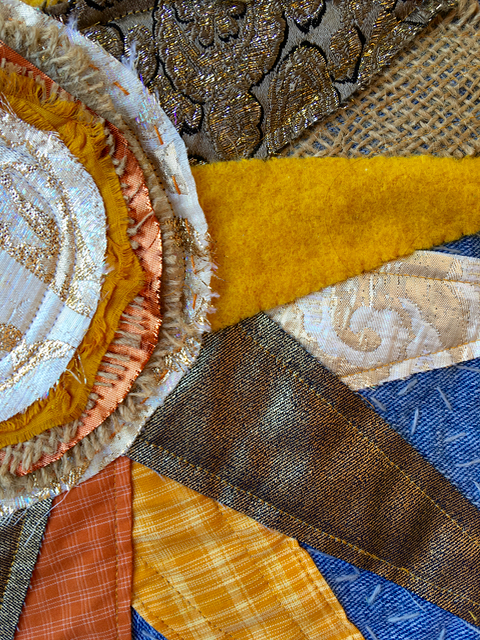 The sunshine your quilts bring get brighter all the time. Happy Day!!!! Your sun is shining !....quite simply ! Love your sunny challenge, so creative, well done. How fun Rachael! That sun is warming me up in cold, old Melbourne town tonight! I love the frayed look too! 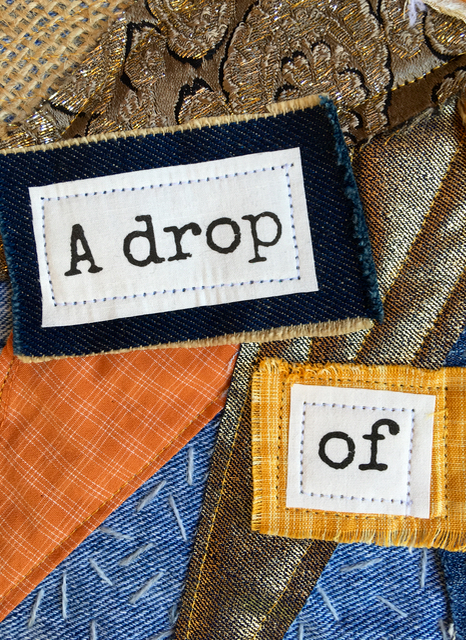 I have used it on my latest art quilt too, but with a bit more subtlety. I'm left wondering how you got such clear bold lettering? very fun little piece. great textures and color. Great theme for a challenge. off to see the others. Love it so much! Even the back is just so clever with the full sleeves! Really enjoyed seeing the other entries, too. I knew the words were from the song right away before I ever scrolled down, now to try and get that song out of my head today. I also am wondering how you did the letters. 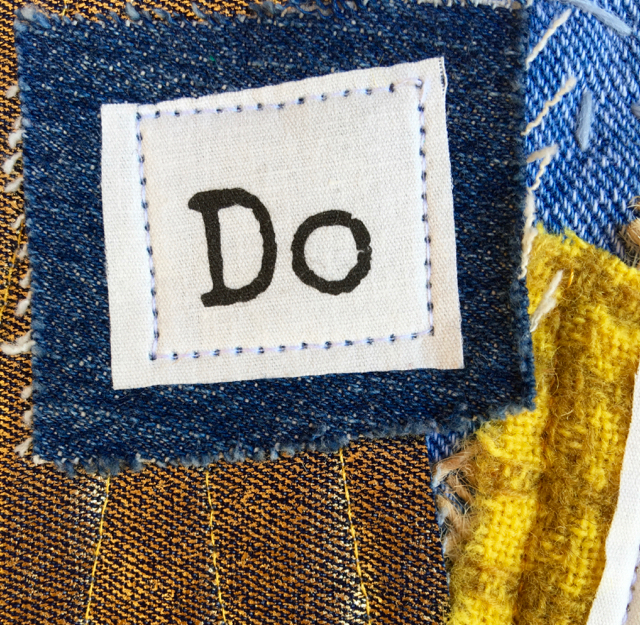 I many times want to add words to a quilt. Any advice?? Sensational! I love your interpretation (one of my favorite movies as well). Thanks for the link. I had fun looking at all the creativity. Recycling is something we do quite well here in Maine. Unfortunately not all of our states are as conscientious! Thanks for sharing. So clever and fun! I love the addition of the texture from the burlap and the shirt sleeve on the back is pretty cool! This is a lovely interpretation for the challenge. Great use of textures and techniques. And a lovely reflection of you. very creative ~ love all the elements you have used. Hai interpretato il tema alla perfezione! I like it with all this recycled fabrics. Raw edges is interesting too, it gives a different look, it's great. I love your sun, so bright !!! Lovely l Rachael now I'm going to be singing Do Re Mi all day! You are so fantastically original with your work! PS. I'm intrigued Rachael.....any chance of seeing the back of this quilt please? Is it all shirt backs? Haven't visited for awhile, love your thought and design process for this great little ray of sunshine quilt! Congratulations on such a wonderful finish. What a happy happy little quilt!